Yam is a good source of Vitamin B6 which is needed by the body to break down a substance called homocysteine, which can damage blood vessels walls. High levels of homocysteine can also lead to heart attack despite having low levels of cholesterol. Thus, having a good supply of Vitamin B6 in the body is believed to reduce the risk of developing heart diseases. Potassium is an important component of cell and body fluids and controls heart rate and blood pressure by countering the hypertensive effects of sodium. Low intake of potassium-rich food can also lead to hypertension. 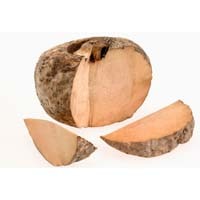 Dioscorin, a storage protein found in yam is known to benefit people suffering from hypertension. Dioscorin inhabits aniotensin converting enzyme which therefore leads to increased kidney flow and reduced blood pressure. Yam is particularly useful for menopausal women. It contains an enzyme that provides a natural alternative to hormonal replacement in women who have reached menopause.Wild yam is also known to support the female endocrine system. Yam has amazing anti-ageing benefits. It contains amazing skin-friendly nutrients like beta carotene, Vitamin C, Vitamin B6 and antioxidants which can help to prevent wrinkles and other signs of ageing. Boil some yam and leave aside to let it cool. Mash it properly and add a dollop of honey. Apply it all over the face and let it stay for 30 minutes. You can also soak your feet in the boiled water to calm and relax your feet. Cut slices of yam and place them on your eyes. Tubers have natural bleaching properties which help to reduce stubborn dark circles and rejuvenate the eyes and treat wrinkles as well.